One of six children including a twin brother. Moved to Horwich as a young boy when his parents became landlords of the Victoria Inn on Chorley New Road. On leaving school, he worked as a butcher’s assistant. He was called up during the Second World War and served in India. After the War he worked at Horwich Loco Works in the foundry. 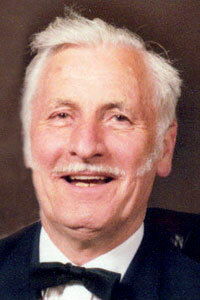 For many years he was a member of the St John Ambulance Service and was often called on to administer first aid. Elected to Horwich Council representing Central Ward in 1987. Represented the Town as Mayor at the celebration of the 100th anniversary of St Mary’s Parish, to which he belonged. His wife, Honoria (Nora), was Mayoress. 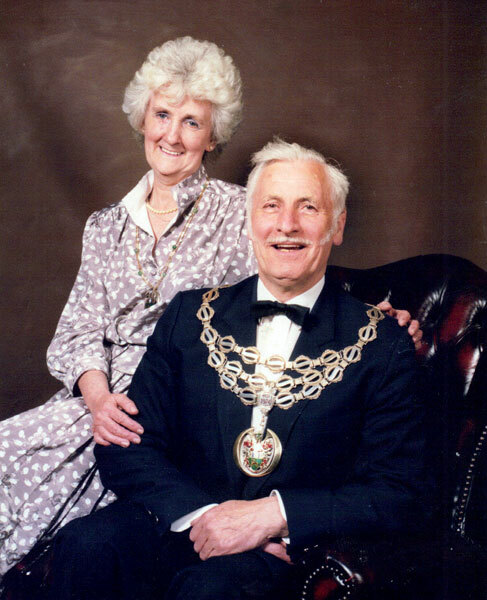 Formal portrait of Albert and Nora Swindells as Mayor and Mayoress of Horwich.